Trophy wives rejoice! 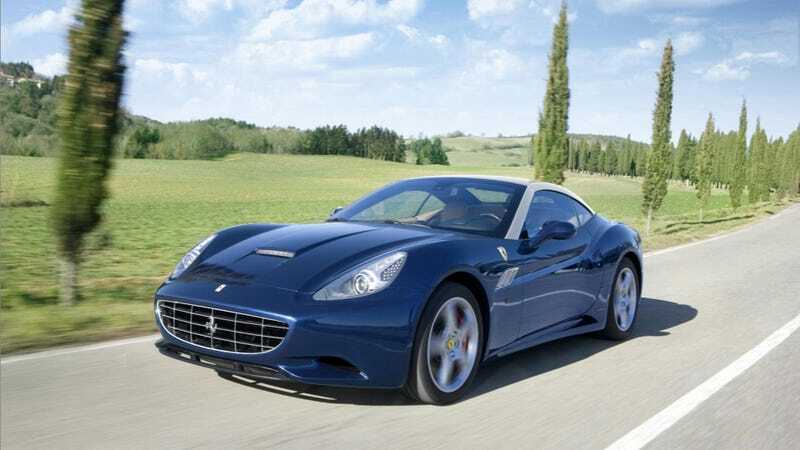 The 2012 Ferrari California will get you to Barney's that much faster thanks to an increase in power to 490 hp and a removal of around 66 pounds — or one Olsen Twin. They've also added a Handling Speciale package for those inclined to drive somewhere other than Madison Avenue. It's easy to dismiss the California as the go-to car for someone who wants a Ferrari but has no idea what that means because it's the go-to car for someone who wants a Ferrari but has no idea what that means. This reality doesn't mean the car can't also be a world-class performer. With the drop in weight and increase in power comes an acceleration time now at 0-to-62 mph of just 3.8 seconds. Not shabby. The "Handling Speciale" package adds the Magnetorheologicalicious dampers found on the 458 Italia, stiffer springs, and a 10% quicker steering ratio. And it wouldn't be a new Ferrari if there weren't more colors. Yeah, colors! Two tone finishes. Three-layer paint. Goody.